'A Beautiful Monster' suggests our Monster may have come from another world ! There will be a prize for the best story and the best picture from age groups Primary 1-2, 3-4 and 5-7 . See www.thelochofmeymonster.co.uk for more details. and attached poster. The best school from last years competition Castletown are currently practicing to record; 'The Loch Of Mey Monster Song' with the author this should come out later this year. The story will appear in book form later in the year. 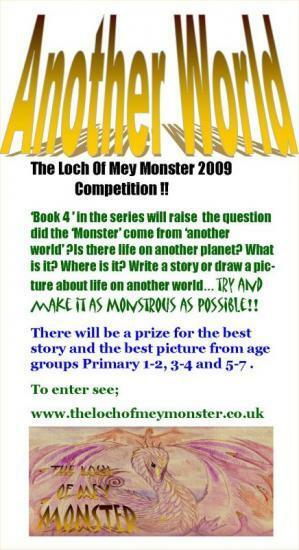 Graham Winkle the author of the Loch Of Mey Monster series of Children's books and organiser of a successful drawing competition last year, is running another competition for Primary age children across the country. But time is running out to enter.